Juicy, tender and bursting with flavor! This Cilantro Lime Mexican Roast Chicken is so good on its own as a main dish or served as the protein in many Mexican inspired meals. Whisk together first 6 ingredients in a large and deep glass container. Drain chicken of excess juice and remove packaging and gizzards from inner cavity of chicken. Place chicken into marinade. Spoon marinade over top of chicken and into cavity. Cover with plastic wrap and refrigerate while marinating. Turn chicken halfway through marination. Marinate for at least 12 hours, preferably 24-48 hours. 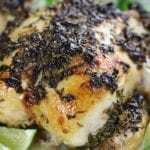 Remove chicken from marinade and drain of excess juice. Place in a small roasting pan. Spread congealed olive oil containing chopped cilantro evenly over the top of chicken. Bake for 1 1/2 hours or until internal temperature reaches 165℉. Remove from oven and let rest for 7-10 minutes and slice to serve.